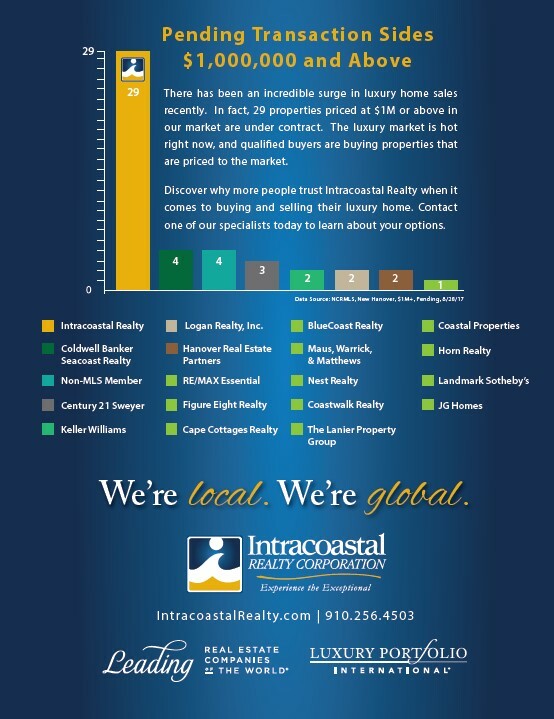 Logan Realty, Inc. BlueCoast Realty RE/MAX Essential Nest Realty We’re Coastal Properties Landmark Sotheby’s local. We’re global. IntracoastalRealty.com | 910.256.4503 Intracoastal Realty Hanover Real Estate Partners Horn Realty Maus, Warrick, & Matthews Coldwell Banker Seacoast Realty Non-MLS Member Figure Eight Realty Coastwalk Realty JG Homes Century 21 Sweyer Cape Cottages Realty The Lanier Property Group Keller Williams Pending Transaction Sides $1,000,000 and Above Data Source: NCRMLS, New Hanover, $1M+, Pending, 8/28/17 4 4 3 2 2 2 1 29 29 There has been an incredible surge in luxury home sales recently. In fact, 29 properties priced at $1M or above in our market are under contract. The luxury market is hot right now, and qualied buyers are buying properties that are priced to the market. Discover why more people trust Intracoastal Realty when it comes to buying and selling their luxury home. Contact one of our specialists today to learn about your options.